It was November 4, 1922, and another hot day in the Valley of the Kings. It was always hot, and dry, and dusty. But the Valley had yielded countless finds and many treasures, so the heat and aridity did not stop industrious diggers from their pursuits. The British Egyptologist Howard Carter was just the latest in several generations of archaeologists who had been exploring the Valley in their search for tombs of the great kings of ancient Egypt’s glittering New Kingdom (1550-1069 BCE). He had been digging in Egypt since 1891, but his main pursuit since the days following World War I was the tomb of a little-known pharaoh named Tutankhamun. They had found a handful of his statues, they had seen his name on monuments, but where was he buried? Carter’s sponsor was the British noble Lord Carnarvon (George Herbert), and it was Carnarvon who was financing Carter’s search for Tutankhamun. But Carnarvon was getting tired of shelling out his fortunes for so little gain, and this dig in November 1922 was in fact Carter’s last chance. It was supposed to have ended already, but Carter had talked Carnarvon into one last season. So imagine Carter’s amazement on that dusty day when one more sink of the pickaxe struck a stone step under the sand. Clearing the sand away, they found a stairway that descended below ground to a door—and that door still bore the necropolis seals. This tomb promised to be intact. The discovery of this tomb, designated KV62 according to the ordering system in the Valley, is the stuff of archaeological legend. We needn’t dwell on it here. There is a mountain of literature about the discovery and tomb clearing, and I would refer to the reader to most any book written by a reputable historian or researcher. The opened door to the tomb. Carter is second from the right; Carnarvon is to Carter’s right. Suffice it to say, Carter and his team spent years clearing almost 5,400 artifacts from this small tomb: foodstuffs, furniture, jewelry, shrines, statues, chariots. funerary items, and of course his mummy. It was like a neglected garage that had never been cleaned. It certainly made Carter famous, and although he never dug again, he spent much of the rest of his life on the lecture circuit, recounting his glories to enthralled audiences all over Europe and the United States. Carter was the right man for the excavation. He was disciplined and meticulous. He and his team labeled, photographed, and plotted every last object retrieved from the tomb. You can see pretty much all of it on the Griffith Institute’s website Anatomy of an Excavation. At the same time, Carter was a challenging man to work with. He didn’t seem to care much for most people and disliked crowds even more so. The media was little more than a nuisance to him, so he was overly selective in whom he allowed to cover his excavation efforts. He certainly did not get along well with the Egyptian government, nor did the government care much for him. The discovery caused a sensation the world over, so this must not have sat well with Carter in some ways. Every day people stopped by to watch the work, and Carter was often stopping his progress to give impromptu tours to important Europeans on holiday in Egypt. Carter was aware of the excitement his discovery was causing, but he would rather he and his team have been left to their own devices. So I sometimes wonder what Howard Carter would think of people’s fascination with Tutankhamun today. Working in two different, beautiful ancient Egypt exhibits in Chicago, I am not surprised by how often the subject of King Tut comes up. If the average person thinks of an object that represents the glory and mystery of ancient Egypt, I’m willing to bet the Great Pyramid is what comes to mind. If the average person thinks of an individual, it is likely to be King Tut. There is an irony to this. To those of us today, Tutankhamun might seem to be the most famous king from ancient Egypt. But in point of fact, Tut was a fairly minor king. He was at the end of a long line of very powerful kings we call the Tuthmosides. To this line belongs some truly powerful kings revered by later generations of Egyptians, such as Tuthmosis I, Tuthmosis III, and Amunhotep III. Also in this line are highly controversial and endlessly fascinating kings like Hatshepsut and Akhenaten, who were erased from history by later kings. And of course later there were powerful kings like Ramesses II, against whom Tutankhamun did not measure up. Tutankhamun just did not live long enough. He came to throne around 1343 BCE and was only around nine years old. He was dead ten years later. So he simply didn’t have the longevity to accomplish much and make a name for himself. Added to this was his association with the oddball king Akhenaten, the heretic who proscribed the worship of many traditional gods. 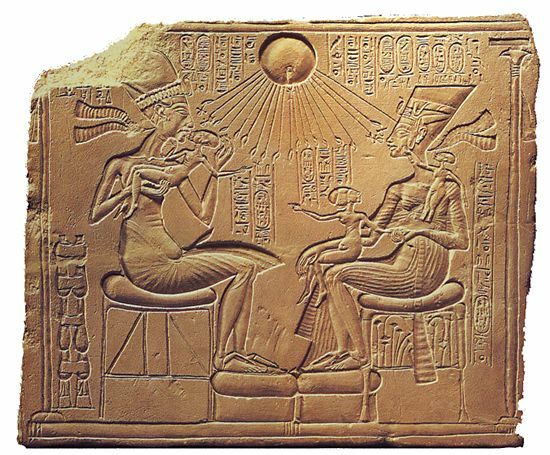 Later kings wiped out Akhenaten’s memory, and part of that memory was the boy Tutankhamun. This is why so little had been found by archaeologists by Carter’s time. Nevertheless, today King Tut is one of the most recognizable icons of pharaonic times. The exhibits featuring artifacts from his tomb pack in millions of people the world over. I worked one of them at the Field Museum in 2006. It was at our museum for eight months and brought a million people just through our doors. There are countless books about King Tut, both non-fiction and fiction, there are movies—there is a whole pop-culture craze that swirls around this dead boy king. I have a tissue dispenser in the shape of Tut’s famous death mask: the tissues come out of his nose. The 2016 film Mr. Peabody and Sherman even features King Tut. The young heroine Penny seems smitten with the boy king and agrees to marry him, and nothing Peabody and Sherman say can dissuade her. The only thing that changes her mind is when Tut’s advisor tells her that when the king dies, she also must die. I spent a lot of time at the museum after this movie came out, ensuring kids that in real life back then, the queen was not put to death when the king died. I eventually watched the movie myself, and inaccuracies aside, I recommend it for some good laughs. It’s just another part of the Tut phenomenon. It is simply Tut’s tomb that made him so famous to us. It contained so much gold and bling and riches, so many mysterious and fascinating objects, that even from 1922 it made Tut a household name. A great deal of mystique and mystery have been attached to Tut because of KV62, because until that point in time, every royal tomb that had been excavated, had already been picked clean by raiders millennia ago. Just imagine what might have been inside the tombs of kings like Tuthmosis III, Amunhotep III, and Ramesses II. A great deal of nonsense has also been attached to King Tut and his tomb. One of the greatest misconceptions is the curse of King Tut, which is more Hollywood than reality. Some of it was caused by the misinterpretation of inscribed artifacts within the tomb, but there simply is no curse inscribed in that tomb. The news anchor showed an image of the coffinette and there was a closeup of hieroglyphs that one could see inside it. The anchor proceeded to explain that those hieroglyphs were a written curse. I very nearly screamed at my TV. Or maybe I did scream. The inscription was not a curse but a ritual prayer. This is a good example of how the modern media tends to distort the facts. There are all sorts of wild, half-baked fringe ideas about Tut. One of the most popular is that Akhenaten and King Tut were aliens, mostly because the artwork of that period shows their bodies in distorted styles. One of the amuletic devices found on Tut’s mummy was a meteoric dagger, and because meteors come from space, this only encourages some in the fringe to build on the alien scheme. But as the pages of my humble blog reveal, the fringe has attached itself to ancient Egypt and has no shortage of ways to distort and misrepresent this ancient culture. As I write this article, there is a new exhibit in the works for Los Angeles: King Tut: Treasures of the Golden Pharaoh. It opens March 2018. As far as I have been able to determine, Los Angeles is the only venue. This exhibit is in preparation for the installation of Tut’s treasures in the new museum Egypt has been building at Giza, which will be opening in the near future (or so they say). Once Tut’s treasures are in place at Giza in the new museum, they might not travel ever again. But we’ve all heard that before. There is much we still don’t know about King Tut. How he died remains one of the greatest questions today. His mummy has been poked and prodded and studied more than any ancient body from history, literally right down to his DNA, but there is still no universal agreement on cause of death. There is still much we don’t know about the Amarna Period, the time period in Dynasty 18 when Tut lived, mainly due to the later kings so industriously wiping away Akhenaten and Amarna history. We still can’t be absolutely certain of the order of succession between Akhenaten and Tutankhamun. Many questions remain, and that only adds to the mystique. Tutankhamun is both enigma and rock star. He is one of history’s greatest icons. He will continue to enthrall everyday people, and I will continue to talk about him and answer questions at the museum. I don’t mind in the least. Tut is not one of my own “favorite” pharaohs, but his Amarna Period is endlessly fascinating to study. The romance of King Tut just never seems to get old in popular culture. Some time ago my friend Mary Jo was facilitating in our Egyptian exhibit with a young couple. The young man and woman wanted Mary Jo to tell them more about the Hebrews who were slaves in Egypt. Specifically, they wanted to learn more about how the ancient Jews built the pyramids. Mary Jo answered quite correctly that we have no evidence that the Hebrews were involved with pyramid building. Now, as one might imagine, this is a topic that pops up frequently in our exhibit. Some docents are well versed in the subject, some don’t really care to discuss it in fear of offending visitors. It is never our intent to offend. Our intent is to inform and educate. So, as I stress to prospective docents whom I train, we must be honest. Diplomatic but honest. Mary Jo herself is particularly good at doing this. But she was a bit nonplussed when the couple with whom she was speaking seemed offended and argumentative. They didn’t want to believe her information. They had walked off before I could get the chance to take part (and side with Mary Jo—I love a spirited argument). I enjoy talking about the Bible in our exhibit. For the most part I meet people who are very open minded and want to know the facts. I’m only too happy to share the facts. I’ve discussed these matters with everyone from Christians who have a layperson’s interest to Orthodox rabbis who’ve forgotten more about the Old Testament than I’ll ever learn. So when I heard about Mary Jo’s encounter, I thought it might make for a useful article on my blog. I wanted to write it sooner, but as my previous article expressed, I’ve been dealing with some weighty health issues lately. This, the 4th of July, is a good opportunity to write the article at long last. It’s either that or do nothing but watch some reruns of NCIS. That said, who really built the pyramids of Egypt? And what’s the origin of the myth that ancient Jews built them? The latter answer I’ve known for many years, and the former answer I’ve been researching for much longer. And along the way I’ve learned a great deal about all extremes of the myth. When thinking of ancient Egypt most people picture the Great Pyramid of Giza, the biggest of them all. It was erected in Dynasty 4 for a powerful king named Khufu (c. 2540 BCE). Consequently many regular folks think this is the pyramid the Hebrews were forced to build. All of us docents hear this, practically every day we’re there. And it’s a worthy topic to discuss. It might be wrong, but at least it’s grounded in something plausible on the face of it. I’d much rather discuss that than aliens building the pyramid or that the pyramid was some sort of high-tech power plant, topics which are divorced from reality. We won’t waste time on them here—we’re sticking with the Hebrews (although there’s always material for future articles). Well, then, where did the myth start? Why do so many people take it as fact that Hebrews built these incredible Egyptian monuments in the Early Bronze Age? It must be Hollywood, right? Well, Hollywood has done much to perpetuate the myth, but movies aren’t the origin. In the first century CE, when Rome ruled the world, there was a prominent Jewish man from Galilee named Joseph ben Matityahu who became a general of Hebrew forces in the first Jewish uprising against Rome. He surrendered to Roman forces in 67 CE. In short order Matityahu was granted his freedom and took the name Titus Flavius Josephus—the “Flavius” portion being the family name of the Roman emperor Vespasian. …they set them [Hebrews] also to build pyramids: and by all this wore them out, and forced them to learn all sorts of mechanical arts, and to accustom themselves to hard labour. So that’s where it starts. Down through history, the error was compiled and compounded. Now, Josephus was a brilliant man and well educated, so much of his tracts on Jewish custom and law are arguably reliable. But as with other writers of late antiquity, the farther back in time an event was that he wrote about, the less accurate it tends to be. And the pyramids of Egypt do indeed date far back in time. They were already remarkably ancient by the time Josephus lived. Some adherents to the Bible play more loosely with the facts, and they can be clever. Exodus 1:11 talks about how Hebrew slaves built the store houses of Pithom and Ramses, and in their labors they made mud brick. Well, quite a few of the smaller pyramids are in fact made largely of mud brick, with stone exteriors and chambers. Well, there you go! So some historians and enthusiast. especially from early times, have figured that these mud-brick pyramids were older and less refined than the bigger masonry pyramids like the Great Pyramid, so the Hebrews must’ve built those mud-brick pyramids. It has some internal logic, right? The Egyptians must’ve been learning along the way and got better at their engineering and architecture, so their monuments got only bigger. It looks like little more than a big anthill today and is not so impressive on the outside. What makes it stand out is the full range of Pyramid Texts inscribed onto the walls of its interior chambers. That was not yet a tradition in Khufu’s early time. Unis was the first king to have these texts (religious funerary spells). The Egyptians continued to erect smaller pyramids until the end of Dynasty 6, when the Old Kingdom ended and the government and country collapsed. It descended into civil war. Pyramids were still sporadically made through this troubled time, although still of mud brick. Egypt rebounded wonderfully in the Middle Kingdom (c. 1990 BCE) and more pyramids were erected, but still only of mud brick. No pyramid ever again would reach the height and grandeur of the Great Pyramid, even though kings of the Middle and New Kingdoms were arguably a lot more powerful than Khufu. The religion was changing at all levels, as the underworld god Osiris was embraced by all classes. Pyramids were no longer the focus they used to be. Such images on tomb and temple walls do in fact often depict slaves at work, but they’re not Hebrews. The inscriptions that often accompany them say they’re Syrians, Libyans, Nubians, and other such foreigners—but they’re not identified as Hebrews. Almost every king of the New Kingdom in particular has been charged as the pharaoh of Exodus. The fact is, from the Egyptian perspective and outside the pages of the Old Testament, there is simply no evidence the Exodus even occurred. I don’t want to derail us with a long diatribe on the historicity of Exodus, mainly because I’ve already written an article on that (see “Exodus: Fact or Fiction?“). This happens to meld nicely with archaeology of the Holy Land, which shows a people identifiable as “proto-Hebrew” starting to rise among Canaanite populations in the Levant at the tail-end of the Bronze Age. So historically, temporally, and physically, the Hebrews could not have built the pyramids of Egypt. Well, then, who did? Was it aliens? Apologies, I’ve already promised we’re not going to go there. That answer is also simple: the Egyptians built the pyramids. And they really weren’t slaves. Not technically. But they didn’t have much say in the matter. If a king needed soldiers for a military campaign or a lot of workers to build a big monument, he had all the manpower he needed. In an early period such as when Khufu reigned, men could be drafted into the military or into works projects; Egypt didn’t have a professional standing army until the New Kingdom. Word would go out from the court to the regional governors to raise manpower. In occasional Old Kingdom tombs, some autobiographies actually include the tomb owner’s pride in being able to raise all the men the king wanted from his region. This was a system called corvée labor, and it was common throughout the ancient Near East. In many instances those subjected to corvée labor were not paid, but we know the Egyptian laborers were paid. This was generally in foodstuffs, beer, cloth, and the like. And the men assigned to work gangs were not forced to spend the rest of their lives in labor. They would spend a number of months at the work site, and were then sent back home to their fields and herds. Fresh manpower was raised as needed. This is not to say no slaves were present, because certainly some were. But slaves were more commonly sent under military guard to distant quarries to fetch more exotic stones, and other such tasks. Most workers on-site were paid laborers. I’m not going to dumb things down by saying all of these paid laborers were thrilled and honored to be part of the king’s work project. I can’t begin to imagine how grueling and dangerous the work could be. And we’ll never know how many men were killed while building something like a pyramid. But they weren’t slaves—and they certainly weren’t Hebrews. You can’t force an entire people into slavery if that people’s culture and society didn’t even exist yet. The fact is, we don’t have much evidence for Hebrews in Egypt in any numbers prior to the Late Period (starting c. 731 BCE). By that time they were largely merchants and mercenaries serving the king’s army and residing mostly in very southern Egypt, in their own communities around Elephantine. They would later cluster in very northern Egypt, in and around Alexandria. And of course by that time, when the Greeks had taken over Egypt, the pyramids were already very ancient. As we docents like to remind folks: the pyramids are older to Cleopatra than she is to us. There is no mention of the pyramids in the Bible, in the Old Testament or otherwise. The Hebrews of old don’t mention them because they, the Hebrews, had nothing to do with the pyramids. As always, I thank you for reading and welcome your comments. My bibliography is largely the same as that for other articles I’ve written, such as for Exodus; this new article approaches the information from a different angle. Now we’ll take the opportunity to examine hieroglyphs more closely: their categories, their phonetic functions, their orientations in context, and some examples of inscriptions. As a rule hieroglyphs can be classified into three broad categories: logograms, phonograms, and determinatives. Logograms: Glyphs representing specific words. Phonograms: Glyphs representing specific sounds. Determinatives: Glyphs used for classifying words. What complicates things is that certain glyphs might move from one of these categories to another, depending on how they’re used. The student must train himself not to focus on a specific hieroglyph in an inscription but on groupings of glyphs, just as when we read English we don’t search out specific letters but rather recognize whole words. In each case the first column shows the glyph, the second its transliteration symbol, and the third the common way most of these glyphs are pronounced in English and other modern languages (which in all cases does not necessarily represent the potential ancient pronunciations). A note on transliteration: This is a system employing basic characters from the Western alphabets to represent the sounds or sound approximations of the ancient pronunciations. When typing something like this blog, in which font selections are limited and one doesn’t have access to the full range of transliteration characters, there is a simplified system called Manuel de Codage (see here). Henceforth this simplified system is what I’ll be using, when needed. In my chart above, the last two glyphs at bottom-right represent a convention developed by the ancient scribes to represent certain sounds that were not part of the ancient Egyptian language. The recumbent lion, then, was often used to represent the “L’ sound (and in some cases so was the mouth glyph), while the lasso stood for a long “O.” Examples are seen in the Greek names Ptolemy and Cleopatra. You can see by the transliterations of these two glyphs that in both cases, when used in regular Egyptian words, they’re actually biliterals. At top is a scribal kit: a reed stylus, cord with water pot, and palette with ink wells. Behind the kit is a squatting man, which in this case is the determinative. The kit tells use the word “sesh” while the man clarifies the word denotes a person, in this case a scribe. At bottom is the scribal kit again, so once more we have “sesh.” But here at the end is a papyrus roll tied closed, a determinative which tells us the word is something to do with the writing arts: “document” or “to write.” As sense signs determinatives are not read aloud; they are merely literary aids. If you haven’t already guessed it, sS is a biliteral. There is a rich collection of determinatives, and again, a glyph used as a determinative in one case might mean something else if used another way (the squatting man above, for example, might elsewhere be used as a noun for man or person or even as a pronoun). You might have noticed something about the columns of transliterations in the above charts: the absence of vowels. The fact is, we have a poor understanding of vowels in the ancient language. Pure vowels do not appear in the hieroglyphic repertoire. You see weak consonants that might act like vowels in some cases, such as our own letter “Y,” but in practice vowels weren’t written. As with other Semitic languages like the original Hebrew and Arabic, the consonants were the important thing. The speaker would use skeletal groupings of consonants and plug in vowels to produce words. Much the same is true for writing: a literate person would see groupings of consonants and automatically know how the vowels would work. This means we cannot know exactly how a lot of the ancient vocabulary sounded when spoken. As a convention in modern linguistics we tend to add a schwa (a mid-central vowel sound, like a neutral “E”) to help flesh out words so we can speak them. You see this in my own example of sS (“sesh”). The same is true for names and other proper nouns. Linguists have been a bit freer with adding vowel sounds to names just so they sound more natural when we speak them. This is why you might find King Tut’s name spelled as Tutankhamun, Tutankhamen, and even Tutankhamon. In truth all we have preserved in the pronunciation of that name is transliterated as twt-anx-imn. Earlier I mentioned phonetic complements. This is a somewhat fussy aspect of hieroglyphic writing but it’s useful to point out and easy to understand. In some cases hieroglyphs might have different sound values or meanings from one use to the next—it is again context that will often point this out. But phonetic complements help to remind the reader of the final sounds of a glyph, which in turn help to remind one of the glyph’s meaning. A biliteral will often carry one phonetic complement at the end of the glyph to represent its final sound, and a triliteral its two final sounds. At left is a biliteral bird glyph denoting the sound value wr; the mouth glyph at the bottom denotes that the final sound is an “R.” Next is the familiar glyph of the ankh, a triliteral (anx) followed by its complements “N” and “KH” (a kind of guttural sound). There are other rules to muddy the waters, including honorific transposition. This is where a grouping of glyphs is purposely out of order because a glyph denoting something of importance (a king, a god) is placed first even if not spoken first. At left is a flag or banner and a club. The flag is a triliteral (nTr) often used to denote a god, goddess, or divinity in general. The club in this case is the biliteral Hm, meaning “servant.” You would speak the term as Hm-nTr (“servant of the god,” that is, “priest”) but in writing the banner is first due to its importance. Similarly, in the second example is a plant glyph at top representing the tiliteral nswt (“king”) with its phonetic complements. Below is a duck denoting the biliteral sA (“son”). You would speak the term as sA-nswt (“son of the king”) but in writing the glyph for “king” comes first because of its importance. If that’s not enough, there is also graphical transposition. This is where glyphs are purposely out of order simply because graphically or aesthetically, they look better that way in an inscription. In both honorific and graphical transposition, it’s just a matter of knowing the vocabulary and the glyphs to understand how to make sense of them. Generally look for hieroglyphs that represent living things or even parts of living things. Starting at far right (note the little arrows), the plant glyph is pointing off to the right. Next, the bird glyph looks to the right. Behind the bird, the open hand faces the right. Farther in, both the eyeball and squatting figure favor the right. Behind them, the bent arm with hand faces the right. This means you read the inscription from right to left. When one glyph is above another, you always read the top glyph first. One of the fun things about hieroglyphs is how they can be multidirectional, even on the same monument. The direction the glyphs face will clue you in. Most horizontal inscriptions are right to left in ancient Egyptian, as in the above example, but you will see left to right, too. Plenty of inscriptions are vertical, which means you always read top to bottom (never bottom up); in a vertical inscription, the direction of the glyphs will tell you whether you’re reading right to left or left to right, top to bottom. I’ve heard tell of a single ancient inscription that was deliberately written bottom up, but I’ve never seen it and am left to wonder if it’s a modern myth. Many inscriptions and texts include not only hieroglyphs but figural art. There is often a common-sense approach to reading the direction of these, too. Here is the final scene in the Book of the Dead of the temple chantress Isty (probably Dynasty 21), from the Field Museum. At left is a shrine in which you see the enthroned god Osiris and his sister-wife, the great goddess Isis. They look off to the right. 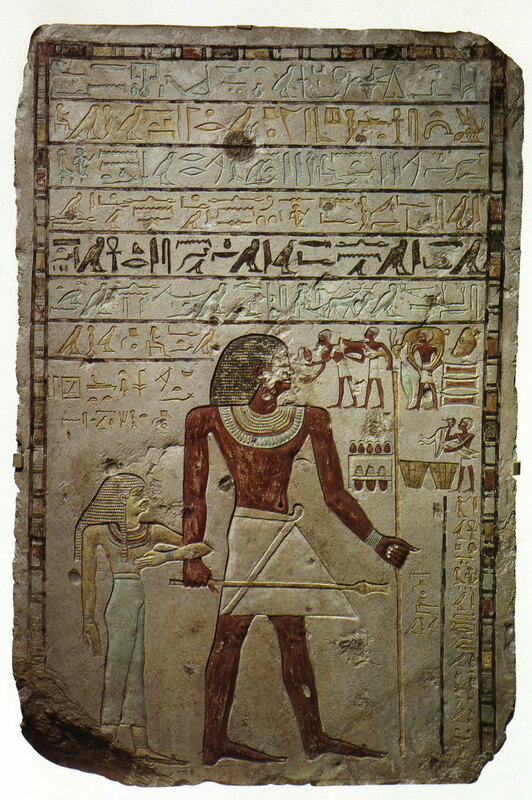 Note that the hieroglyphs immediately in front of them all face to the right, telling us that part of the text reads right to left—it faces the two deities and reads into them, telling us that the inscription concerns them (and in fact the start of the text tells us Osiris is speaking). Meanwhile, the lady Isty looks to the left, into the shrine. Her glyphs just to the right of the shrine face to the left, so they are to be read left to right. This part of the text concerns Isty herself. So when glyphs accompany figural art, there is often an order and a relationship between the two. Hieroglyphs and figural art were generally a unit. I’ve segmented it into blocks so that we can break it down into logical bite-sized chunks. First you’ll notice by the direction of the glyphs that this is read right to left. You’ve probably already noticed how the glyphs in such texts are arranged in neat squares and rectangles where possible. We call these arrangements cadrats, which was simply for the economy of space. Let’s look at the numbered segments. Block 2 is a very typical spelling for the name of the god Osiris (eye ball, throne, and squatting god). Block 3 uses the basket (half-circle) to denote the word “lord” and behind it the name of the city Djedu, one of the chief cult centers for the god Osiris. Block 4 is the epithet “the great god,” and Block 5 again starts with the “lord” basket and then the name of the ancient site of Abydos, Osiris’ chief cult center. Block 6 then starts the action Osiris is performing on behalf of the person for whom the formula was written. The outstretched arm with bread loaf is another way to say “to may give,” and the serpent below it is actually a suffix male pronoun (thus, together, “that he give”). Block 7 begins the listing of what the deceased will receive; in this case, the rectangular house plan with descending paddle says “a voice offering” or “invocation” of “bread” (the bottom right-most glyph) and “beer” (the bottom left-most glyph). Then, in Block 8, the offerings continue with self-descriptive glyphs: oxen and fowl. The cylindrical glyph is a cake, and some read this while others view it as a determinative and do not read it. The three slashes below the cake is one of the conventions for expressing plurality. Block 9 is seen in many offering formulae and adds “linen and alabaster” to the offerings. Block 11 is the title of the man for whom this formula was written. The personified pot from which liquid pours refers to the man literally as “pure one,” which we typically render as “priest.” Here the three water ripples are determinatives for the water pot, and not prepositions (the water ripple served numerous purposes in the ancient writing). In Block 12 we come to the man’s name. The biliteral game board with its phonetic complement give us mn, and the pair of reed leaves a y. This renders the name Meny, a fairly common one in ancient Egypt. The squatting man at the end is a determinative, which can be one way to help recognize a name in an inscription. Again, it’s not the purpose of this article to teach you hieroglyphs. A blog can’t do that. I just want to give you a general idea how glyphs work. Ancient Egyptian was a very different language from English or most any modern Western language. For one thing, while English is an SVO language (favoring an order of subject, verb, then object), ancient Egyptian was VSO (verb, subject, then object). Ancient Egyptian generally lacked the linking verb “to be” but contained a rich and complex arrangement of adverbial and prepositional phrases of the sorts not quite seen in English. Pronouns were also somewhat complex. Some were independent and stood alone much like our pronouns do, while others stood as suffixes at the ends of words. Words did have genders as with German and other European languages, and as with French, adjectives followed the nouns they modified. There was only a limited use of articles, and usually more so in the later stages of the language. Perhaps all of this gives you a sense of challenges one might face when conducting translations. In many cases it can be straight forward, but in many others, due to the very different syntax and grammar, it can be tricky. This is why one translator might come up with something different from another translator, although if they both did their work sufficiently, the overall meaning of the translations should meld with each other. In the final installment of the article, we’ll look at actual examples of inscriptions and translate them. Until then, thanks for reading. Allen, James P. Middle Egyptian: An Introduction to the Language and Culture of Hieroglyphs. 2001. A couple of years ago during a quiet moment in the Egyptian exhibit at the Field Museum, I was walking around the gallery when a young kid walked up to me with a notebook in his hand. “Excuse me, sir,” he said, “would you help me to figure out what these hieroglyphs mean?” He showed me his notebook to reveal a bunch of glyphs he had seen in the exhibit, and drawn as carefully as he could. Now this is my kind of kid, I thought. His name was Michael and he was eight years old. It’s not unusual, in my experience at the museum, to encounter a youngster with an interest in ancient Egyptian hieroglyphs. But Michael exhibited a deeper interest in one so young, and I was delighted to spend some time helping him to understand the inscriptions he had drawn. In fact, we ended up spending quite awhile together, his mom observing quietly from the background. I thought it might be fun to do an article on ancient Egyptian hieroglyphs, to help readers to understand how they work and why they are so important to our broader understanding of ancient Egypt. After all, were it not for our ability to read the ancient writing, we would ultimately know almost nothing meaningful about pharaonic Egypt. We might even still be laboring under the fable that the pyramids of Giza were grain silos (with apologies to Dr. Carson, but really?). My article will not teach you to translate and understand hieroglyphic inscriptions. That takes a lot of training and a significant amount of time and commitment. But hopefully I can aid you in understanding the basics of how hieroglyphs work. The next time you’re at a museum you might even be able to pass along some of this knowledge and impress your friends. One of the enduring mysteries of ancient Egypt is how the hieroglyphic script developed. The evidence for this has come in fits and starts and we’re forming a better picture of it today, but much remains to be learned. It used to be thought that the hieroglyphic writing system emerged around the time of the founding of the Egyptian kingdom (c. 3100 BCE), which placed it second in antiquity only to Sumerian cuneiform. But then came Günter Dreyer and his team from the German Archaeological Institute. 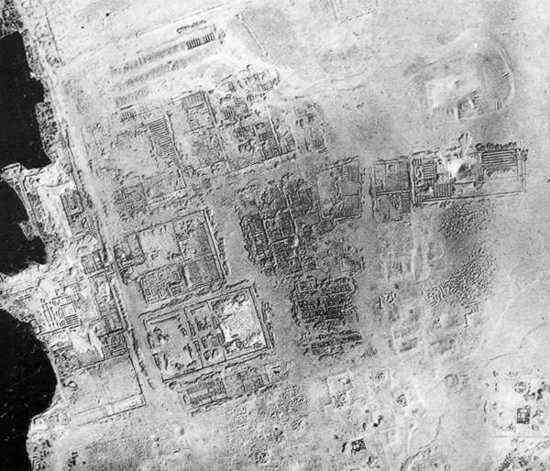 Dreyer had been digging since the 1970s at the sprawling site of Abydos, where Egypt’s earliest rulers had been buried. 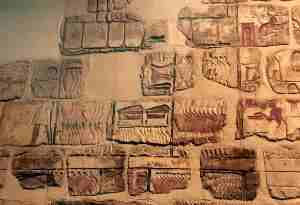 In 1988 in Cemetery U at Abydos, Dreyer and his excavators unearthed a tomb that would change our understanding of history. Designated Tomb U-j, it’s one of the largest tombs in that area of Abydos and dates to late prehistory. Carbon dating places it at about 3320 BCE. What set Tomb U-j apart from the rest that date to that early time were the nearly 200 ivory and bone tags excavated there. At 3320 BCE, they were inscribed with the earliest-known hieroglyphs. This bumped back the emergence of Egyptian hieroglyphs to a time contemporary with the earliest Sumerian cuneiform. This now leads Assyriologists and Egyptologists to quibble over whose form of writing came first. Hopefully future archaeological evidence will clarify this for us. There is still a lot of debate over how exactly the ivory tags should be interpreted. Günter Dreyer himself seems confident that they can largely be read phonetically, in the manner of hieroglyphic inscriptions from the pharaonic period. Not everyone agrees, but there is largely consensus that the tags represent the names of estates from which goods buried in Tomb U-j came. 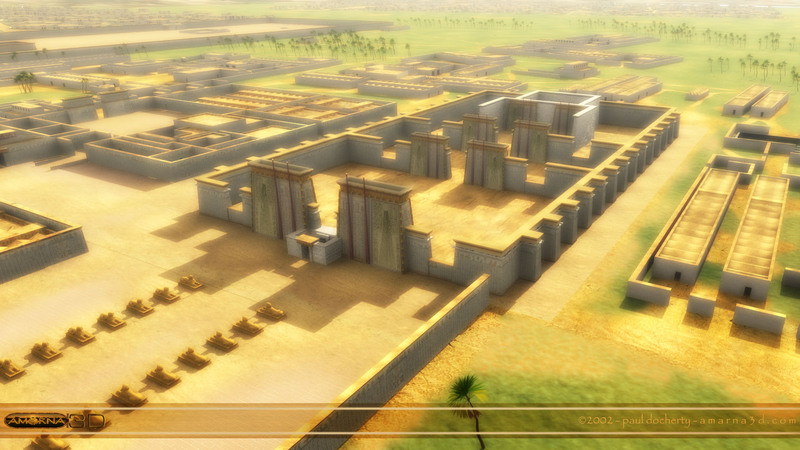 Tomb U-j represents a formative stage in late prehistoric Egypt. No single ruler controlled all of the Nile Valley yet. Rather, regional rulers or “proto-pharaohs” controlled their regions of Egypt. This was especially true in Upper (southern) Egypt, where successions of rulers in the prehistoric cities of Hierakonpolis, Naqqada, and Thinis (Abydos) were vying for greater control over the southern reaches of the Nile Valley. This is where the kingdom of Egypt would be born (c. 3100 BCE), eventually to absorb the regions of Lower (northern) Egypt. It’s believed that the hieroglyphs first appearing in Abydos were a regional or local convention, and that this form of writing was absorbed as an ideological tradition by the earliest kings once the kingdom was founded. The writing system was already well established by Dynasty 1 (Early Dynastic Period), and was well regulated and formulated by the onset of the Old Kingdom (2663-2195 BCE). As was the fate of most human languages down through time, ancient Egyptian eventually died out. It thrived for thousands of years, and even though it’s gone, the fact that it was written has frozen it for us like a time capsule. We can see its cognates and relations to other Semitic languages and how it changed as a spoken tongue down thought time. 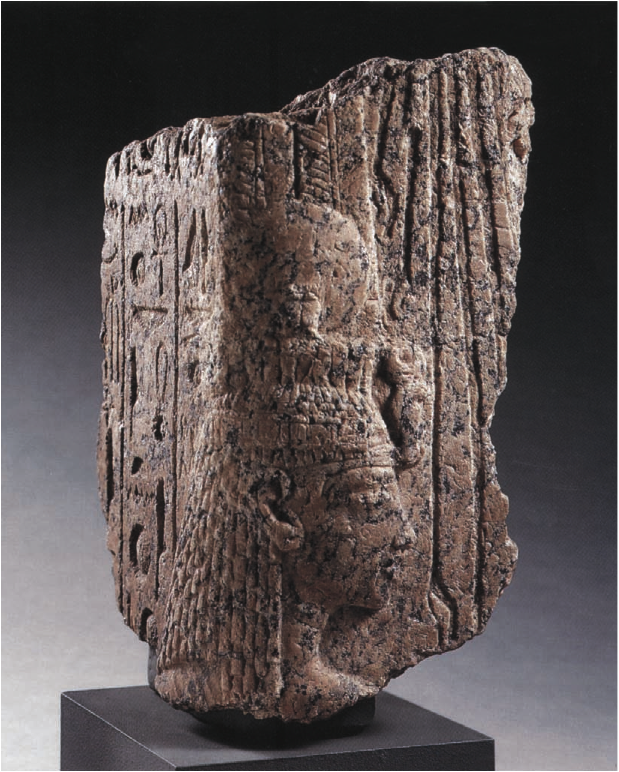 Ancient Egyptian belonged to the Afro-Asiatic family and was related to languages that still exist such as Hebrew, Arabic, Aramaic, Berber, and Chadic. Hieroglyphs weren’t the only form of writing in pharaonic Egypt. In fact, hieroglyphs probably stopped representing the every-day spoken tongue by the end of the Old Kingdom. It was maintained (with periodic changes and updates) as a “ceremonial” form of writing and was used mostly for religious and ideological purposes. Hieroglyphs were reserved largely for monumental texts such as funerary inscriptions and royal public decrees. A linear or cursive form of hieroglyphs was often used for religious texts like Books of the Dead, although one sees this form also used in ancient graffiti. A form of writing called hieratic started to appear around the same time as hieroglyphs. Hieratic is based on hieroglyphs but is much more cursive and rich with ligatures. One can often see the shapes of hieroglyphs in hieratic, although the two aren’t the same. Nor do they quite read the same. As mentioned, hieroglyphs fairly soon ceased to represent the daily spoken tongue. This means that as the living language changed, the language of the hieroglyphs did not and represented an archaic form of the tongue. For a long time hieratic was used to write the daily spoken language. An example I often use with museum visitors is Old English to modern English. By the time of King Tutankhamun (1343-1333 BCE), the language of hieroglyphs preserved a form of the tongue about as outdated to them as Old English would be to us. Hieratic continued to be used for administration, legalities, journals, stories, and other daily-life purposes until the seventh century BCE. A new script that rose in the north, demotic, was by then a better representative of the daily spoken language, and soon replaced hieratic for that purpose. Demotic appeared on the scene around 650 BCE. Hieroglyphs were still used for religious and monumental texts, and once demotic arose, hieratic was also put to religious use. Many Books of the Dead and other funerary texts from the later periods, for instance, are written in hieratic. Christianity made early inroads in Egypt. This naturally had profound effects on the culture of Egypt. As Christianity supplanted the ancient traditional religious traditions, closely related practices like writing were affected. Hieroglyphs and hieratic died out by the early centuries CE, and demotic would follow the same fate. The early Christians of Egypt adapted the Greek alphabet and included some demotic characters to represent sounds in the Egyptian language that Greek lacked. This Christian form of Egyptian writing is called Coptic. It was in use for centuries but exists today only as a liturgical language in Coptic Christian masses. Still, Coptic represents the last vestige of the ancient Egyptian language. Islam arrived in Egypt in the seventh century CE, and this too promised profound changes. Arabic supplanted Coptic as the spoken and written language of Egypt. This is a long way to go but I hope paints a clear enough picture. The ancient writing went extinct, and with it the ancient language. Coptic went some way to preserve the language, but the Egyptians themselves forgot how to read the ancient hieroglyphs. And once the Egyptians forgot, so did the world. Down through time the occasional educated person attempted to make sense of Egyptian hieroglyphs, but none succeeded. Others seem to have made it up as they went along, a good example of which was Athanasius Kircher (1602-1680). As with many others, Kircher was convinced the hieroglyphs represented a strictly ideogrammatic language of esoteric wisdom. On an obelisk in Rome he encountered an inscription originally commissioned by Ramesses II in the thirteenth century BCE (most of Egypt’s obelisks had ended up in Rome thanks to the avid collecting habits of great Roman emperors). It goes on and on, painfully. Modern folks bent on alternative or fringe histories have their own bizarre ideas. I remember coming across a web page where an Egyptian fellow argued that ancient Egyptian wasn’t really a dead language but was actually an early version of Arabic and spoke of Allah. But down through time people did not even have any idea of how to approach the ancient script. There were those like Kircher who believed it revealed esoteric knowledge, and there were many who believed the little pictures in the script had to be taken literally. That is, a depiction of a hand must mean hand, one of an owl must mean owl, et cetera. As long as folks had these ideas in mind, there was certain to be no progress. That changed in 1798 when an ambitious general named Napoleon Bonaparte invaded Egypt in an effort to control shipping and trade routes through the Mediterranean (and hence get the better of their British rivals). With his expedition Napoleon brought a large number of historians, engineers, artists, and other specialists to study the ancient land of Egypt. In 1799 soldiers working on a fort near the Delta town of Rosetta were disassembling an old wall when they discovered a large stone slab covered in writing. The top two-thirds were covered in hieroglyphs and another strange script, while the bottom third contained ancient Greek. This would go on to be known as the Rosetta Stone. Napoleon had no problem conquering Egypt from the Mamluks who had been controlling it, but they did not do so well against the British. Admiral Horatio Nelson destroyed the French fleet fleet in the Battle of the Nile, and Napoleon fled Egypt. To the victor go the spoils, as it were, the the British confiscated the Rosetta Stone. It’s been in the British Museum ever since. It wasn’t the end of Napoleon, of course. He would rise to rule France and conquer most of Europe. Meanwhile, a young Frenchman of humble birth, Jean-Francois Champollion, was making strides in his efforts to learn languages. The fellow was a natural linguist. Early on Champollion developed a keen interest in Egyptian hieroglyphs, and wanted nothing more than to decipher that script. Most of Champollion’s instructors were highly skeptical of his goals, which left the young man largely to strive on his own to decipher hieroglyphs. He managed to get an inked copy of the Rosetta Stone but worked even more so from the epigraphic drawings people had made during their trips to Egypt. Meanwhile, in Britain, there were those bent on figuring out the mysteries of the Rosetta Stone. They were led by the polymath Thomas Young. Any scholar worth his salt could read ancient Greek in those days, so they figured it would be a relatively simple matter to compare the ancient Greek at the bottom of the stone with the hieroglyphs at the top, and affect a translation. It wasn’t quite that easy, of course. They were able to determine that the odd script in the center of the stone was another version of ancient Egyptian (what we now call demotic), but they could not translate it. Young was able to prove that the glyphs inside the cartouches at the top of the stone were used to spell the name Ptolemy (from the line of Ptolemies who had ruled Egypt in the Greek period), so that established that hieroglyphs could be used to write foreign names. Therefore, hieroglyphs had phonetic properties. But Young and his team made no progress on the rest of the stone, and many argued that in native Egyptian it didn’t represent a form of writing so much as a conveyor of ideas. Back in France, young Champollion believed differently. He was one of the few who intuitively understood that the Coptic language of Christian Egypt was the last vestige of the pharaonic tongue, so he turned to a local Coptic priest, attended Coptic masses, and learned the liturgical Coptic language. This proved critical. Champollion was working on some drawings a friend had made in Egypt and turned his attention to a cartouche in the transcriptions. The inscription had been copied at Abu Simbel, a site on the very southern fringes of Egypt. 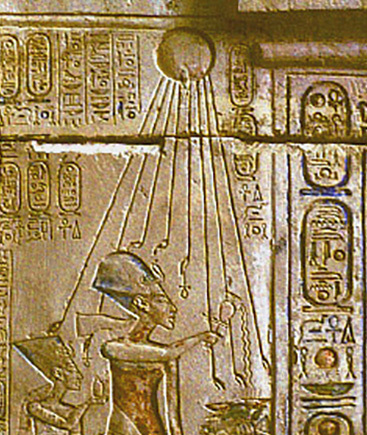 Champollion knew the Coptic word for “sun” was “re,” and this cartouche had a sun disk in it. The rest is history. As the story goes, Champollion read the name in the cartouche and ran excitedly to his brother’s house to give him the news. And before he could deliver it, Champollion fainted dead away. His brother put him to bed. Champollion had a penchant for over-taxing himself, and his tireless efforts had caught up with him. Champollion did not yet have a mastery of all the glyphs, of course, but he knew enough to understand what was written there: Ramesses. This was the cartouche of Ramesses II, one of the greatest pharaohs ever to sit on the throne of Egypt. Eventually Champollion was able to go to Egypt himself. The story of his life is actually quite fascinating, between his involvement with the fortunes and fall of Napoleon and his efforts to stay out of the crosshairs of the Catholic Church, which was terrified that he would find proof the world was older than Christianity preached. But true to form, Champollion over-taxed himself and suffered a stroke while in Egypt. He died shrotly after returning home. Champollion proved hieroglyphs could be read as a mix of phonetic and logogrammatic writing. He achieved a great deal in his short time, and one wonders how much farther we might have come had he lived to a ripe old age and taught us even more. In the next installment we’ll take a look at how hieroglyphs work and the different kinds the Egyptians used. Thanks much for reading. And Happy Holidays to the WordPress community. In July 1835 one Michael Chandler arrived in Kirtland, Ohio with four Egyptian mummies and a collection of Egyptian papyri. At this point in time Joseph Smith, founder of the Mormon church, was living in Kirtland. Around five years earlier Smith had completed his Book of Mormon for his nascent religion, and in constructing the Book of Mormon he is said to have interpreted golden plates containing an obscure language he referred to as “Reformed Egyptian.” It is not surprising, then, that Smith should take an immediate interest in Chandler’s small but valuable collection. Within a month Smith and members of his church had rounded up the funds and purchased Chandler’s collection for the sum of $2400 (Ritner 2013: 1). Soon thereafter Smith recruited several church members as “scribes” and set about examining the papyri. Smith is said to have quickly recognized the biblical nature of some of the papyri, including one he regarded as “The Book of Abraham”. This papyrus (designated P. Joseph Smith 1) is the focus of my article. A hypocephalus similar to one originally in the Smith collection, but now lost. This amuletic device, usually made of papyrus and plaster, originated in the Late Period (664-332 BCE) of ancient Egypt and contains Spell 162 from the Book of the Dead, a spell providing heat and light (thus, life) to the deceased (Taylor 2010: 61, 130). It was placed under the heads of mummies. As mentioned, I’m going to narrow my focus to the text Smith named “The Book of Abraham.” For a more comprehensive treatment of the full set of papyri, there are numerous modern sources but I would recommend Robert Ritner’s The Joseph Smith Egyptian Papyri: A Complete Edition (Signature Books, 2013). Ritner, a prominent Egyptologist with the Oriental Institute at the University of Chicago, has exhaustively researched these papyri and their backstory. Smith interpreted the papyri in a similar fashion to his Book of Mormon with its mysterious golden plates written in “Reformed Egyptian.” The main difference here is, while no evidence exists for the golden plates, most of the papyri in question are still extant and plenty of people, from professionals to laymen, have examined them. Smith had his scribes at the ready while he examined the papyri and “dictated” the contents of their ancient writing. The manuscripts which record his interpretations are still in the archives of the LDS, and the church men who acted as scribes are named in the manuscripts. So at least we have a fairly detailed written account of how Smith approached the matter, from the hands of his own brethren. These records include an “Egyptian Alphabet” which Smith devised to show how he “translated” the papyri. That is to his credit, I suppose. Always show your work, after all. But it should be pointed out that Egyptian hieroglyphs had been deciphered by the Frenchman Jean François Champollion in 1822, only thirteen years before Smith conducted his “translations.” As a matter of fact, news of Champollion’s achievement did not widely reach the United States until the early 1840s. By this time Smith was publishing his “translations” in Mormon literature. In other words, there was no one yet in the Western Hemisphere who could realistically understand or decipher ancient Egyptian writing (which further includes the more cursive hieratic script seen throughout the Smith papyri). Presumably, as with the mysterious golden plates in 1830, Smith was receiving divine inspiration to be able to interpret the papyri. Some of the papyri, including that called “The Book of Abraham,” contained vignettes (depictions or pictures) which Smith had produced as woodcuts for inclusion in his publication. …having been myself a follower of righteousness, desiring also to be one who possessed great knowledge, and to be a greater follower of righteousness, and to possess greater knowledge, and to be a father of many nations, a prince of peace, and desiring to receive instructions, and to keep the commandments of God, I [Abraham] became a rightful heir, a High Priest, holding the right belonging to the fathers. Woodcut accompanying “The Book of Abraham” as published in 1842. Abraham, fastened upon an Altar. The Idolatrous Priest of Elkenah attempting to offer up Abraham as a sacrifice. The Altar for sacrifice, by the Idolatrous Priests, standing before the Gods of Elkenah, Libnah, Mahmachrah, Korash, and Pharaoh. The Idolatrous God of Ekenah. The Idolatrous God of Libnah. The Idolatrous God of Mahmachrah. The Idolatrous God of Korash. The Idolatrous God of Pharaoh. Designed to represent the pillars of Heaven, as understood by the Egyptians. Raukeeyang, signifying expanse, or the firmament, over our heads, but in this case, in relation to this subject, the Egyptians meant it to signify Shamau, to be high, or the heavens: answering to the Hebrew word, Shaumahyeem. Smith fancied himself a linguist and professed to be able to translate a number of ancient tongues, even though he had no formal education in them. “The Book of Abraham” is probably his most fanciful example of such work. In October 1880 “The Book of Abraham,” along with other literature created by Joseph Smith, was canonized by LDS Church members as official scripture (ibid 61). Eventually there was sought academic opinion on Smith’s “translations,” beginning around 1859. Smith had been dead for fifteen years by then, and Champollion had translated hieroglyphs almost forty years earlier. So by this point in time, many scholars were starting to become adept at ancient Egyptian writing and could offer a reliable, academic assessment of the Joseph Smith Papyri. In 1912 a collection of recognized scholars including A.H. Sayce, W.M.F. Petrie, J.H. Breasted, and A.C. Mace, reviewed the “translations” and uniformly dismissed their credibility (with some measure of derision). Understandably this didn’t sit well with a lot of Mormon members, who could not assault the academic merits of the Egyptologists’ assessments so decided instead to try to attack the character of the field of Egyptology (Ritner 2013: 4-5). This is a typical fringe ploy, or in this case the ploy of a church whose tenet is being questioned, and it never passes muster. If one’s counterargument cannot address and challenge the merits of an academic position, the counterargument has no legs to stand on in the first place. Looking again at “The Book of Abraham,” a proper academic assessment reveals it to be an ancient Egyptian funerary text called the Book of Breathing (also called the Breathing Permit). The earliest appearance of this funerary text is the Ptolemaic Period (332-30 BCE), when the Macedonian successors of Alexander the Great ruled Egypt. Based on textual analysis and the tracing of the family line of this papyrus’s owner, the Book of Breathing which Smith called “The Book of Abraham” can be dated to the first half of the second century BCE (Coenen 2013: 77). This is obviously a very long time after the patriarch Abraham is supposed to have lived (and is beside the fact that no extrabiblical evidence exists for the patriarch, but that’s another matter). This Book of Breathing actually belonged to a Theban priest named Hor (the Greek derivation would be Horus, so this priest was named after the great falcon deity, as many Egyptian men were down through time). It is perhaps useful to explain that by the mid-Ptolemaic Period, the Book of Breathing was beginning to replace the Book of the Dead in many burials, although examples of the latter are still known down to the onset of the Roman period in Egypt. Books of Breathing absorbed some of the content and purposes of earlier funerary texts such as the Book of the Dead. Their main purpose was to preserve the importance of breathing to the deceased, to prolong the existence of the name, and to prevent the eternal “second death” that all ascended souls feared (Hornung 1999: 24). Academic analyses of the Joseph Smith Papyri has gone on until the present, although understandably access to them is highly restricted. A lot of scholars who’ve attempted to analyze the papyri have had to make due with photographs and the analyses and translations of earlier scholars. The actual fragmented vignette in the Book of Breathing of Hor. Intact mummification scene from another funerary text. This is the actual content and nature of “The Book of Abraham.” Not surprisingly it has nothing to do with biblical lore. It is strictly traditional ancient Egyptian funerary material. Also, although Smith proclaimed that this text spoke of Chaldean priests of Ur performing Egyptian rituals, there is no evidence of Egyptian cults from the Mesopotamian city of Ur (Woods 2013: 89-91). This, too, was an invention on Smith’s part, but no doubt allowed him to explain why documents found in Egypt should “relate” such information. The academic assessment takes into account the fact that no one in the United States in Smith’s time could read or understand hieroglyphs, and a careful academic analysis cannot accept “divine inspiration” as an explanation. While his own church members of the time fervently believed in his “translations,” Smith’s own “Egyptian Alphabet” shows he actually had no knowledge of the grammar or vocabulary of that ancient language. The words and interpretations (including the five-part degrees for vocabulary) do not correspond to any reality of the ancient Egyptian language. Joseph Smith died violently in June 1844 and the mummies and papyri passed to his mother, Lucy M. Smith. Lucy Smith died in May 1856, and within a couple of weeks this collection was sold to a man named Abel Combs (Marquardt 2013: 61). After that the collection was sold and resold again, and was eventually split up. In the 1940s some of the papyri ended up in the collection of the Metropolitan Museum of Art in New York. As mentioned earlier, some of the other papyri. including the hypocephalus, is believed to have ended up in a small collection that was destroyed in the Great Chicago Fire. In the mid-1960s the Metropolitan Museum, as museums occasionally do, began to sell pieces of its collection to raise money. The surviving Joseph Smith Papyri actually made their way in November 1967 back to the possession of the Church of Jesus Christ of Latter-day Saints. As all big religions do, the Mormons had their share of problems from within throughout the years, and a breakaway sect that eventually called itself the Community of Christ, in Missouri, subsequently repudiated Smith’s “translations” of the papyri and does not regard them as canonical. The LDS Church continues to regard them as canonical but since reacquisition in 1967 most LDS members appear no longer to recognize them as a literal translation of an ancient text (ibid 67). However, that Smith received “divine inspiration” to discern the overall meaning of the papyri seems still to be the case. As an aside, while doing research for this article I was curious to see what modern Mormons might have to say about the papyri. Online I found a Mormon message board that had several discussions about the papyri, including “The Book of Abraham,” so on some level this material is still relevant to LDS members. I am no atheist and was raised in a conservative Roman Catholic household. I am no stranger to the requirements devout people must have to believe or accept the tenets of their faith, and how strange some of the background to a faith may be. But that’s just it: it’s a matter of faith. Do I believe Smith’s translations or his interpretations of these ancient papyri? Of course not, but I recognize that faith is not science. I welcome comments from believers and non-believers alike, definitely including Mormons. I’ve known very few Mormons in my life and have never talked to them about these papyri, so I’d be curious to hear what active LDS members have to say. Hornung, Erik. The Ancient Egyptian Books of the Afterlife. 1999. Ritner, Robert K., ed. The Joseph Smith Egyptian Papyri: A Complete Edition. 2013. Taylor, John H. Journey Through the Afterlife: Ancient Egyptian Book of the Dead. 2010. One of the most popular exhibits at the Field Museum of Natural History in Chicago is our ancient Egyptian exhibit, which goes by the name “Inside Ancient Egypt.” It’s a large exhibit and not surprisingly one of its biggest draws is the myriad of mummies on display. There are around twenty, originating mostly from the later periods of pharaonic history (which is, coincidentally, the source of most mummies you see in museums). Of all of these mummies the favorite of museum goers and staff alike is usually Harwa. Displayed to the right of Harwa is his elaborate coffin. What makes Harwa particularly interesting is the fact that his head is unwrapped and you can see his face very clearly; there is also the fact that Harwa is unusually well preserved, a happy fate certainly not shared by all Egyptian mummies. I thought it might be fun to do an article about Harwa. What can his mummy tell us about him? What can his coffin reveal to us? When did he live and what did he do in life? In point of fact it’s amazing what we can discern about an ancient person just from his mummy and coffin, so I’d like to share some facts about Harwa with you. First, allow me to clear up a mistake I occasionally see associated with this mummy. This is not the mummified body of the more famous Great Steward and nobleman of the early seventh century BCE who erected a sprawling tomb (TT37) at el-Assif, Thebes. That was an earlier man by the same name. Although “Harwa” was not necessarily a common name in Egypt (and is not even Egyptian in origin, as we shall see), it is attested for numerous individuals in the later dynasties. Possibly the only commonalities between that Harwa and our museum’s Harwa is that both shared the same name, both lived in the Late Period, and both were buried in the vast Theban necropolis. Now that we’ve gotten that out of the way, let’s see what we can learn about Harwa. We’ll start with his mummy. The mummy is that of a Late Period man dating to the late seventh century BCE, specifically to around the early 600s BCE. I’ll explain later why I assign that date to him. While he is commonly referred to as coming from Dynasty 25, I might instead suggest very early in Dynasty 26 (Saite Period, so named because the Delta city of Sais was the administrative capital of Egypt at that time). I should note before continuing that the placement of Dynasty 25 varies according to the preferred chronologies of certain Egyptologists: some place it at the end of the Third Intermediate Period and others at the start of the Late Period. The Field Museum favors the latter placement, as do I. This article is not for the purposes of a discourse on dynastic chronology but the Third Intermediate Period is that length of time during which Egypt was ruled primarily by Libyan-borne pharaohs. Therefore I personally find Dynasty 25 a nice fit for the start of the Late Period—it marks a time of profound transitions when Egypt was fast losing its autonomy, was ruled by foreign powers, and was beginning to approach its historic end. Dynasty 25, for instance, was when pharaohs of Kushitic (Nubian) heritage ruled Egypt. 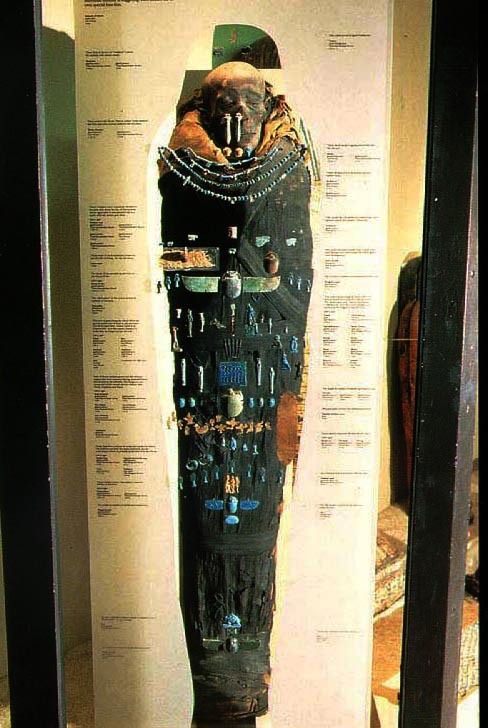 The mummy of Harwa is displayed behind an anthropoid glass shield on which is mounted a rich array of funerary amulets. None of these belong to Harwa (and, indeed, they represent a quantity arguably considerably larger than most mummies would have at any one time). The amulets come from different periods but are excellent examples of their type. They are displayed in front of Harwa to represent an approximate positioning of funerary amulets upon the mummified body, inside the wrappings. In fact, in Harwa’s X-rays I have a difficult time finding clear indications of even a single amulet in his wrappings. Not all people used them in burial. Harwa’s age at death is inconsistent in published material: I’ve seen a range anywhere from early 30s to around 60. While most of us familiar with Harwa tend to favor the older age at death, to my knowledge a properly trained forensic expert has never examined the mummy or its X-rays. When you gaze upon his face, you tend to see that of an elderly man—and 60 years would’ve been very elderly in a time when most males in the Near East averaged about 35 years of life. 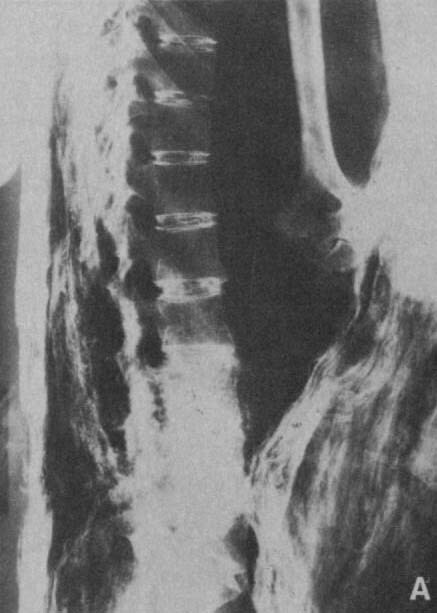 An unusual fact about Harwa is that he was the first mummy to be flown on an airplane and the first to be publicly displayed by X-ray (Martin 1941: 386-388). In the early 1940s the Field Museum loaned him to a special General Electric exhibit in New York where he was displayed behind a fluoroscope that would automatically light up at timed intervals, to reveal the skeleton inside the wrappings. Harwa has been X-rayed more than once through the years, as have many of our Egyptian and Peruvian mummies at the Field Museum. In the late 1970s Harwa was the subject of a medical analysis at Northwestern Memorial Hospital in Chicago, where researchers examined X-ray images and took a biopsy of his right hip to search for signs of disease. Their conclusion is that in life Harwa suffered from ochronosis, a disease causing acid buildup in connective tissues and leading to calcification of some joints and articular surfaces. The researchers found this most notable in the narrowing of Harwa’s hips and knees and by the dark-stained deposits in his vertebra (Stenn et al 1977: 566-568), which looked to be calcified. Similar conclusions have been reached in many other Egyptian mummies in museums around the world, but more modern analyses might indicate otherwise. The world-leading center for the scientific study of Egyptian mummies is the Manchester Museum in northern England. Their scientists have been engaged in advanced and sophisticated scientific examinations of mummies for 40 years. Researchers at Manchester have noted that the finding of ochronosis might be incorrect, and might be better explained by changes in images of the body caused by the mummification process itself, largely due to imaging contrast issues (Adams & Alsop 2008: 38). The preservation is practically perfect. The only damage is a missing little patch of skin above his right eye (not visible in the above photo), which exposes a bit of the frontal bone of his skull. That is likely to be the result of relatively modern damage, from the unwrapping of his head. It isn’t clear whether Harwa’s head was unwrapped before he even came to Chicago in 1904, or at some point in the early years of the museum’s possession. In any case it is no longer the practice to unwrap mummies most anywhere in the world, due to changes in ethical attitudes and, perhaps even more so, to the availability and superiority of CT scans as a tool to study mummies. Some ancient damage is evident to Harwa’s nose. 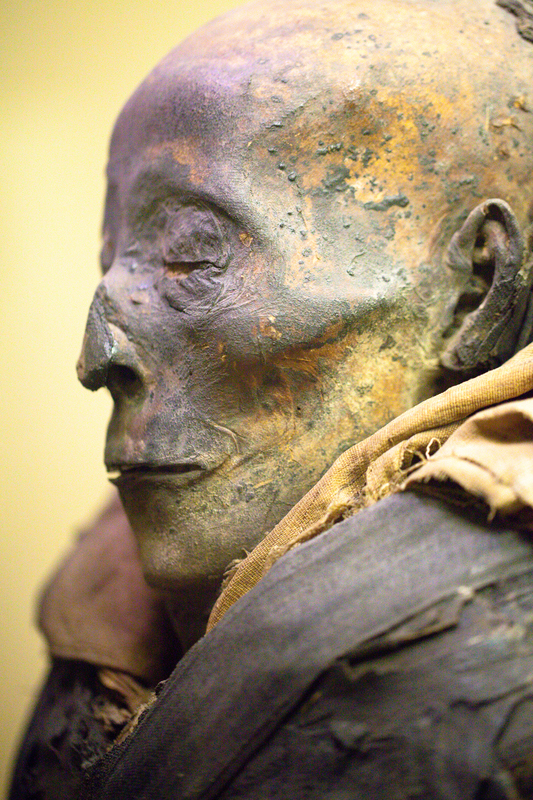 It is common to see collapsed noses on mummies such as Harwa, due in part to the pressure of the bandages simply collapsing the cartilage through time. But if you stand before Harwa and look carefully at his right nostril (not visible in the above photo), you will notice a large tear. 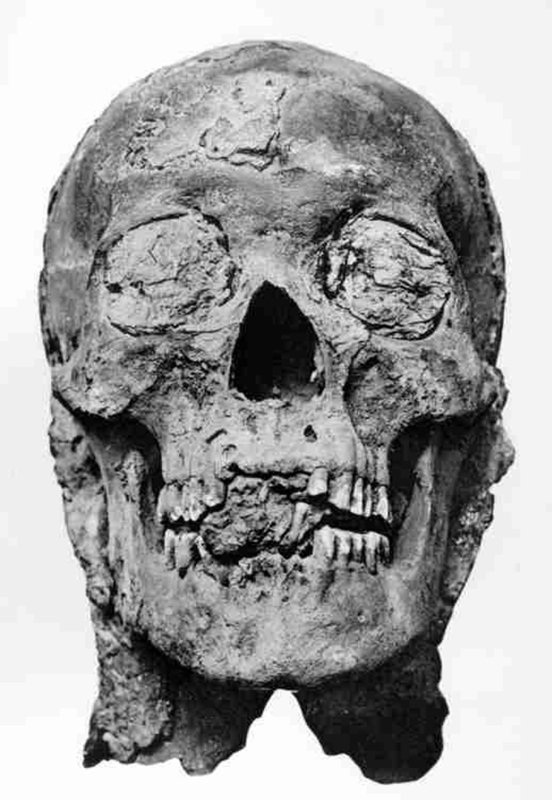 This artifact is damage from the ancient embalming procedure of excerebration, by which the embalmers thrust a hooked rod up the nostril and into the skull to remove the brain matter a bit at a time. The above image gives you a hint of how densely Harwa is wrapped by linen material, which is also evident as the dense white material outside the body cavity in the X-ray image above. Generally the body was first wrapped by thin strips of linen, after which any number of burial shrouds might have been wrapped fully around the body. As was common in the Late Period, both Harwa and his bandages were coated with dense deposits of hot pine resins (both to seal the body and to glue the wrappings together). Many readers are probably familiar with the four Canopic jars in which the embalmers traditionally placed the four organs. This practice had been largely discontinued at the end of the New Kingdom (c. 1068 BCE), perhaps because tomb raiders often smashed and destroyed the vessels (and the organs within them). While Canopic jars were still being produced and would continue as such for a long period of time, they were usually left empty or the stone from which they were made not even hollowed out. The organs in the later periods were often restored to the body cavity or placed between the legs (Ikram & Dodson 1998: 289). So with Harwa we have a man upwards of sixty years of age who lived in the late seventh century BCE. He is extremely well preserved. 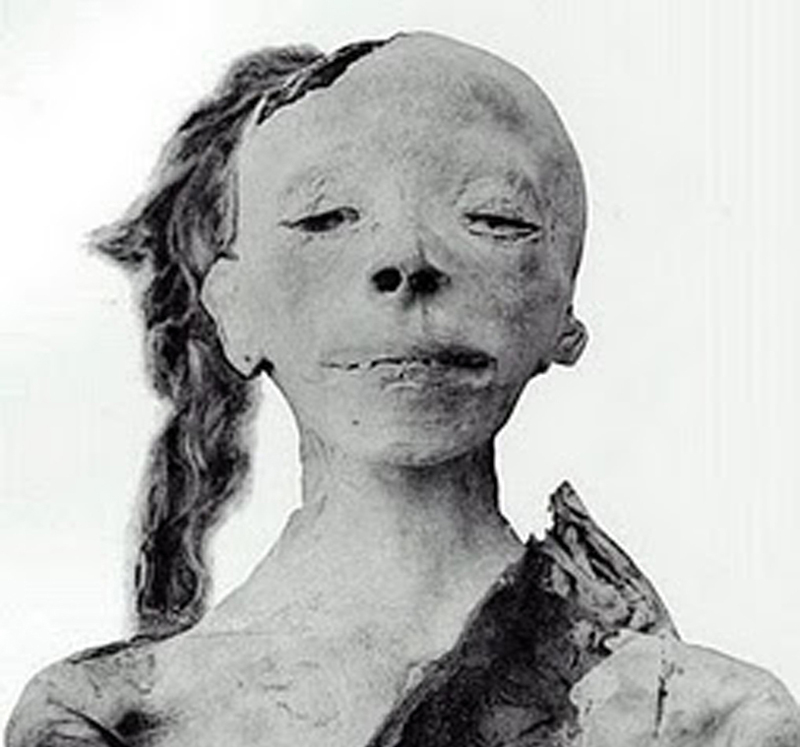 Harwa’s exposed flesh is hairless, which might be due to his job in life (see below) or the putative practice of shaving off the hair for mummification and burial. Certainly not all Egyptian mummies are bald, but Harwa himself is indeed smooth. The cause of death is unknown. Many of our mummies in storage have been CT scanned, which sometimes is a better diagnostic tool for finding evidence of disease, but Harwa has not been and nothing stands out in his skeleton. As stated, the old finding of ochronosis might be in error and wouldn’t have been fatal in any case. At some point it’s possible Harwa will be CT scanned by our curators, and perhaps then some evidence of pathology will present itself. The elaborate coffin in which Harwa was buried is typical of an upper-class man from Dynasty 25 or Dynasty 26. It further confirms Harwa’s elite standing and wealth in his culture, at a time when most people still could not afford mummification and its requisite, costly burial equipment. Unfortunately the coffin is difficult to photograph well because of the dim lighting of the display as well as the faded texts and vignettes, but one can begin to appreciate how expensive such a coffin would be. Unlike many coffins, it’s possible this one was custom made for Harwa. It’s covered with depictions of deities and other scenes and lengthy religious texts, many of them excerpts from Book of the Dead spells (a fairly common feature of Late Period coffins). Altogether the coffin’s design and iconography confirm that it comes from the Theban necropolis (the same massive burial ground where the great New Kingdom pharaohs were buried centuries earlier, in the Valley of the Kings). The beard jutting from the chin is not the sort men actually wore in life, but is a symbol of Osiris, the god who ruled the underworld. The same is true for the green face, which is actually an unusual feature, but Osiris was also a fertility god associated with the fecundity of the Nile Valley crops. 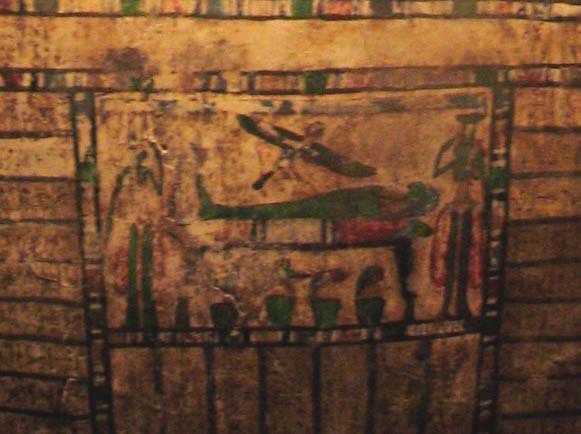 Harwa is shown as a mummy lying on his funeral bed. At his head is the goddess Nephthys and at his feet Isis, both of whom raise their hands to their foreheads in a grieving gesture. 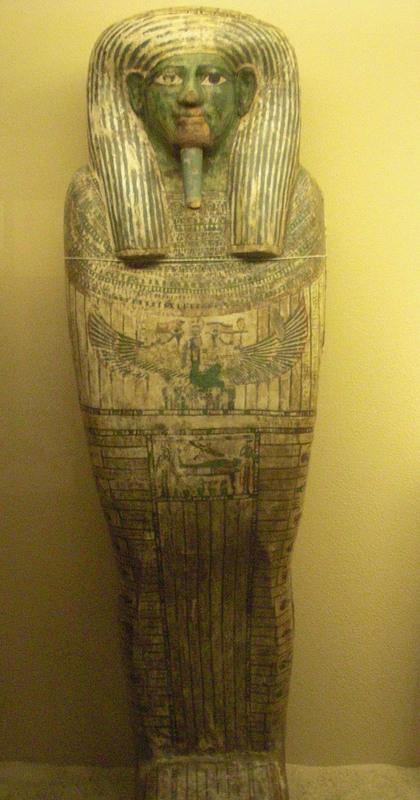 Below the funeral bed are the four Canopic jars, even though Harwa’s stomach, liver, lungs, and intestines are wrapped up in four bundles between his legs (see X-ray above). And above him flutters a human-headed bird, which represents Harwa’s ba—that aspect of the soul embodying one’s character and personality. It was believed that this aspect of the soul needed to return to the mummified body at dusk, where it would remain safe through the hours of night. 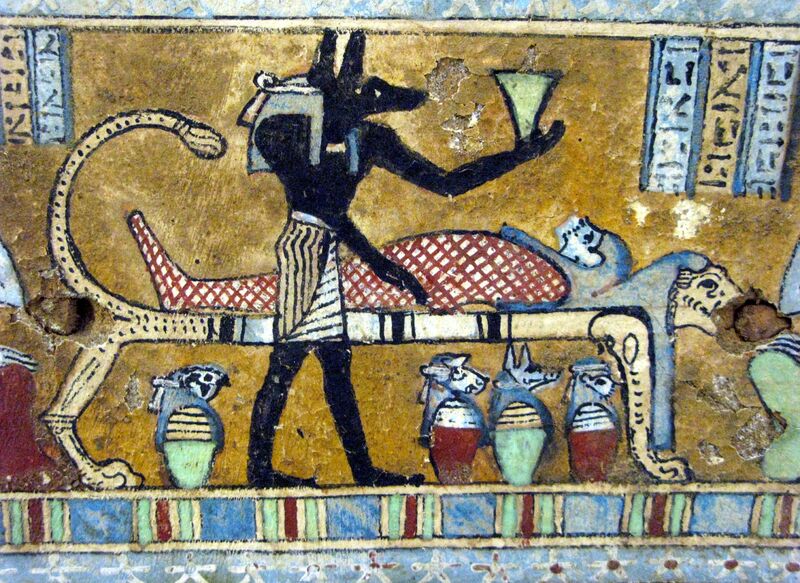 The funerary scene and hieroglyphic texts on the lower portion of the coffin come from Spell 89 of the Book of the Dead. Placing them here ensured that Harwa’s ba would indeed safely return to his mummy every evening before the sun set. She spreads her wings as though to protect Harwa, and in each hand she clutches the ankh symbol (eternal life). Note the pair of eyes flanking the goddess’s head. 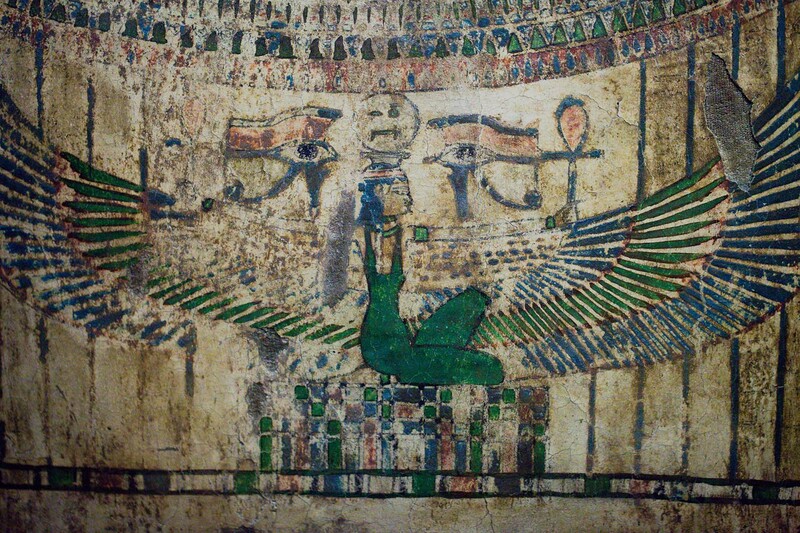 These are the eyes of Horus and were typical on coffins from significantly earlier periods of pharaonic history, as a means to allow the soul within the coffin to see out. On Harwa’s coffin they’re an archaic feature typical of this later period, even though the face of the coffin has a set of human eyes. Note also the disk atop Nut’s head. It contains tiny hieroglyphs which spell her name (nwt). Above the disk is the bottom edge of the floral collar painted onto the coffin. 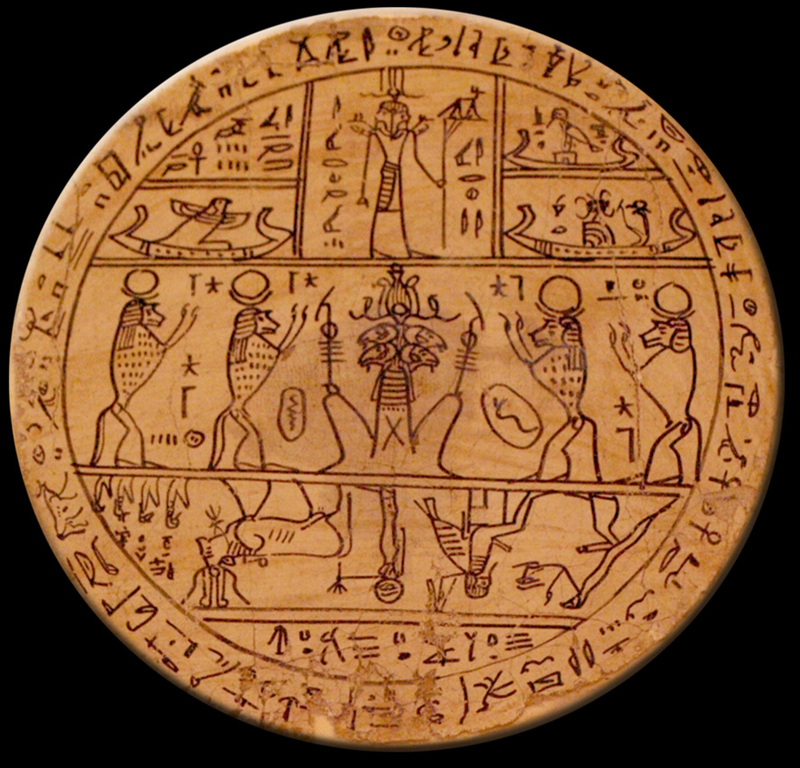 The fact that the disk with glyphs lies just below the collar instead of intersecting it, allows Egyptologists to date the coffin to around 625 BCE or later (Taylor 2003: 115). This is how specific coffin typology can be, due to the development of iconography down through time. To reinforce this date, there are 22 deities depicted laterally down the sides of Harwa’s legs, another feature of the time. This is why I personally would date Harwa to about 600 BCE and to Dynasty 26 instead of Dynasty 25. 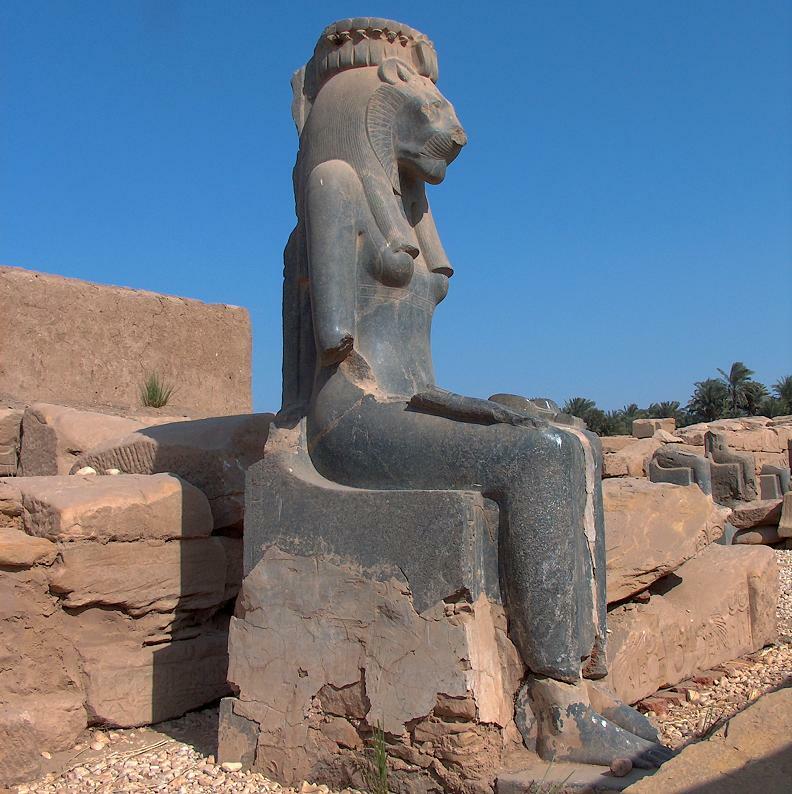 In life, then, Harwa was a doorkeeper in the Temple of Amun, the largest and most prestigious temple in Egypt. His father, Pakharukhonsu, held the same title before him. Pakharukhonsu’s father (and Harwa’s grandfather) was also named Harwa, so perhaps it was a family name—although it was common to name one’s son after one’s father. And Harwa’s mother was named Medi-Iun. The name Harwa appears to be Semitic in origin, with the root H-L-W. It’s attested since Akkadian times under the form elelu and probably means “Beautiful Because Sweet” (Teeter, Gaudard, & Tradritti 2013). Some linguists argue that most or all ancient Egyptian dialects lacked the sound “L,” which might explain why it is rendered the way it is in Egyptian inscriptions. 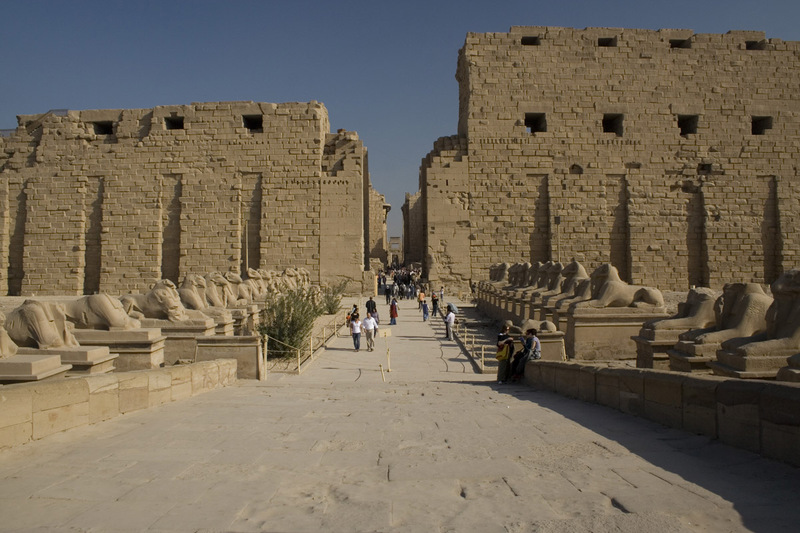 The Temple of Amun (modern Luxor) was an extremely powerful and wealthy institution. As with any large state temple it would’ve had an army of employees, and doorkeepers were of a lower rank (Erman 1894: 304). However, it’s important to understand that the position was more for the sake of prestige than for income, and in fact it’s altogether possible the family’s personal wealth and standing are what landed his father and then him in that position. Typically only the highest-class citizens were involved with the great temples. And it’s clear Harwa was very proud of this: his name and title are repeated many times over the surfaces of his coffin. I should note that published materials also describe Harwa as the overseer of an agricultural estate owned by the Temple of Amun. Given that the great temples—and especially Amun’s—owned vast agricultural lands in the Nile Valley to make themselves self-sufficient, this is quite plausible. However, I have never been able to find this fact in the visible inscriptions, so until such time that I am able to see and translate it, I shall refrain from claiming that title for Harwa. It’s only a pity that the coffin is so close to the back wall of the display case; otherwise, we could note whether there are inscriptions on the back, too. This was common for elaborate coffins of the Late Period. I’ve always wished the curators who designed the exhibit had stuck a large mirror behind the coffin. Harwa’s coffin is a true masterpiece, fitting for an elite man in the Late Period of Egypt. 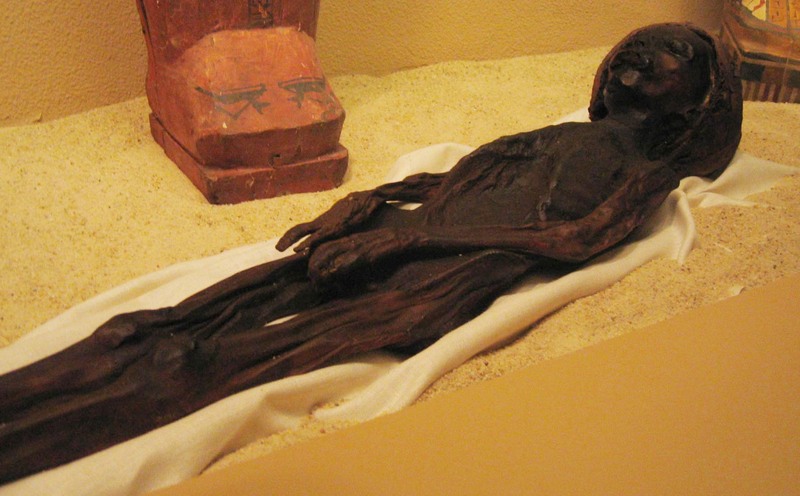 Together with his incredibly preserved mummy, it’s clear Harwa was a wealthy and comfortable man. He is one of the greatest treasures of our Egyptian collection, and I’ve spent years discussing him with enthralled museum visitors. One might say Harwa is our rock star. Thanks for reading. I welcome comments and questions. Adams, Judith E. and Chrissie W. Alsop. “Imaging Egyptian Mummies.” Egyptian Mummies and Modern Science. ed. Rosalie David. 2008. Erman, Adolf. Life in Ancient Egypt. 1894. Ikram, Salima and Aidan Dodson. The Mummy in Ancient Egypt. 1998. Martin, Richard A. 1941/ Vol. 53, No. 4. “X-Raying a Mummy at the Field Museum of Natural History.” The Scientist Monthly. Stenn, Frederick E:, James W. Milgram; Sandra L. Lee; Raymond J. Weigand; Arthur Veis. 1977. Vol 197, No. 4304. “Biochemical Identification of Homogentisic Acid Pigment in an Ochronotic Egyptian Mummy.” Science, New Series. Taylor, John H. “Theban coffins from the Twenty-second to the Twenty-sixth Dynasty: dating and synthesis of development.” The Theban Necropolis: Past, Present and Future. ed. Nigel Strudwick and John H. Taylor. 2003. On the translation of Harwa’s name: Personal correspondence with Emily Teeter and Francois Gaudard of the Oriental Institute, University of Chicago; personal correspondence with Francesco Tradritti, Field Director of the Harwa Mission, Università di Enna Unikore. 2013.